Patriots’ Trey Flowers performed as we’ve come to expect from the four-year veteran edge defender, as he recorded multiple pressures en route to an impressing performance along the edge of New England’s defense. The Patriots defense’ as a whole was great, and the secondary made play after play. Patrick Chung was all over the field in pass defense as was Stephen Gilmore, who did a great job when matched up with Kelvin Benjamin. With no running game to speak of, the Patriots’ offense fell entirely on the shoulders of Tom Brady, who turned in an uncharacteristically shaky performance. Short throws comprised a large portion of the passing game, as is the norm for the Patriots, and allowed them to consistently move the ball. However, more inaccurate throws than normal from Brady led to more field goals than touchdowns and kept this game close for longer than it should have been. Cordarrelle Patterson took on the role of primary ballcarrier with Sony Michel out, and it was an experiment that didn’t go well. Excellent blocking paved the way for a 22-yard run late, but Patterson’s other nine carries produced an average of just 1.8 yards and were largely wasted snaps. Derek Anderson met expectations on Monday night, and unfortunately for the 35-year-old signal-caller, expectations aren’t high at this point in his career. Anderson didn’t have much help from his offensive line or wide receivers, but he didn’t do much to elevate their play. He threw a bad fourth-quarter interception to Pats’ Devin McCourty to seel the Bills’ fate, as well. Before leaving the game with an injury, Tremaine Edmunds was a frequent target in underneath coverage, which did not go so well for the Bills. New England was consistently able to take advantage of the rookie linebacker by getting him matched up with James White and Julian Edelman, leading to a number of easy first down conversions. Linebacker Matt Milano made several plays for the Bills’ defense on the night, but it was a play he didn’t make late in this game that was most notable. On a rare Brady mishap on the Patriots’ first drive of the fourth quarter, Milano was unable to make Brady pay for failing to see him closing on White in the flat. An interception there would’ve given Buffalo the ball in Patriots territory with the game very much still in reach. Instead, the Patriots finished the drive with their only offensive touchdown of the night and put the game out of reach. 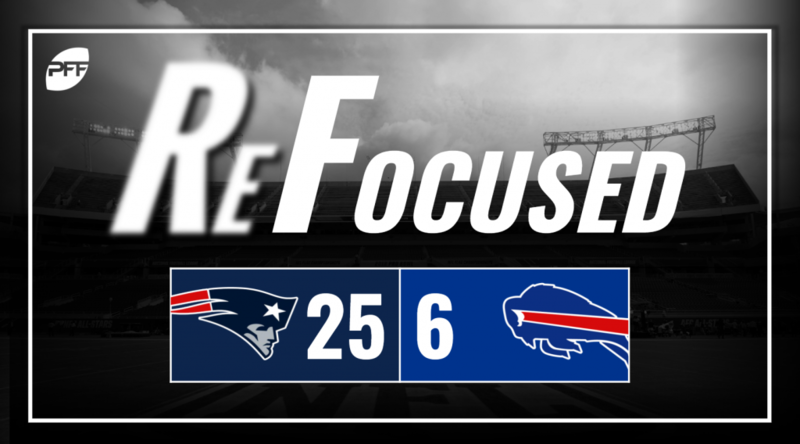 It wasn’t pretty, but with the Bills’ offense unable to match even field goals with field goals, Brady made enough plays to come away with another win. Anderson didn’t have the game he needed to beat Brady and the Patriots, and his teammates didn’t do much to help him along the way.